Motorcycle riders have a reputation as badass dudes who are too cool to care too much about anything but their bike. To them, their motorcycle is everything, and whenever they’re not out riding it, they’re thinking about riding it. That’s why, if you’re thinking of getting them a gift, it be one of the best gifts for motorcycle riders. Luckily, they aren’t too hard to shop for, once you know what they might need. So, whether you’re a motorcycle rider and want to treat yourself, or if you know someone who’d appreciate some extra gadgets and gear, we’ve got you covered. 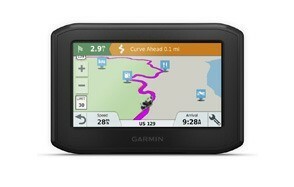 Our first pick of the best motorcycle gifts is this Garmin Zumo 396 Motorcycle GPS. Why would your motorcyclist love his? Well, why wouldn’t he? This little gadget has everything a biker would need for staying safe and secure as they wind through traffic, through scenic roads, or along the exhilarating straights that allow them to go as fast as they please. Compatible with a smartphone, the Zumo allows for hands-free calling and communication, while also providing live updates about traffic and weather. It’s also weather and fuel resistant, ensuring it will withstand the environment wherever you take it. What’s most appealing, though, is the Garmin Adventurous Routing feature, which takes you away from the busy highways and instead suggests exciting hilly and curvy roads, so the biker can indulge in their passion without worrying about idiots in cars ruining the good times. It’s more than just a GPS, it’s a tool to make the most of your rides every single time. If there’s one thing you need to be careful about when operating any vehicle, it’s the tire pressure. You probably already know how it can affect control, so why not ensure your favorite biker stays safe on the roads this winter? 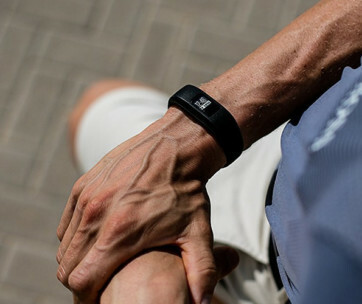 This Garmin Tire Pressure Sensor Monitor makes sure they never find themselves in a tricky situation. So why are these so good? Well, they’re much more than what you first see. What may look like something simple to screw onto the pressure valve and leave will connect with the Zumo and wirelessly monitor the tire pressure, giving you real-time tire pressure information and alerting you to any changes that need to be taken care of. They’re especially useful if they’ll be biking somewhere the roads aren’t as reliable as they’d like, and with the option for customizable alerts, there’s ample opportunity to ensure proper road safety, wherever the road leads. 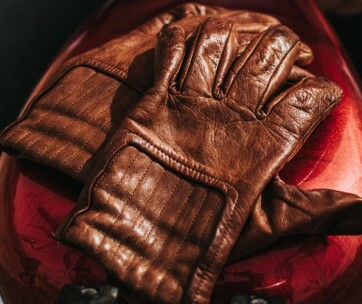 Motorcycle gloves are always a quality choice for bike rider gifts, and these Velomacchi Speedway Gloves are the best and most effortlessly stylish gloves around. With deerskin palms and highland goat backs, they provide both protection and comfort to ease the ache and pain of long rides on your hands, and look good while doing it, too. The rubber finger guards guarantee sturdy, reliable grip, which is what every biker really needs when trying to break the land speed record, and the brass rivets give that extra traction and complement the gloves and give them that classic and unmistakable look. The tan palm contrasts perfectly with the black back of the hand and offers you a little of variety when compared to solid black gloves that fill the market. If you want to go the extra mile for the biker, then providing them with the most modern looking and secure gloves is a great place to start. Everyone talks about safety and security while on the bike, but what about those times where the bike is not in use? 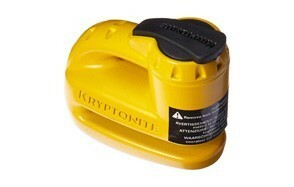 This Kryptonite Keeps 5s Yellow Disk Lock is the perfect product to ensure you don’t wake up one morning to the sight of something missing, especially not something as precious as your most prized possession. Compact, lightweight, and waterproof, it does the hard work so you don’t have to and provides valuable peace of mind when parking the bike anywhere in the world. The dual reinforced security cylinder works alongside stapler-style disc lock to ensure the bike stays exactly where you left it either overnight, or while you run into the store. Sometimes, though, you may forget you’ve attached it at all, to prevent this, there’s a bright orange reminder cable that should stop you in your tracks before any damage happens. And, because you can’t put a price on security, we’ve selected it as our best value, not just because it’s cheap, but because it’s certain to save you more money than anything else we selected. 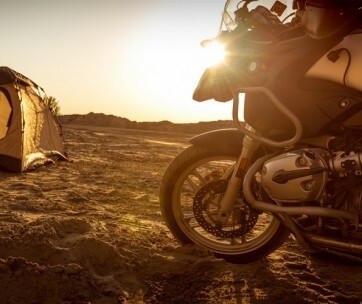 For more great products like this, check out our guide to the essential motorcycle camping gear. While something that carries your smartphone may not seem like the best of the motorcycle gift ideas, it’s not designed to distract or watch Netflix on. Instead, it allows for fast reading for maps and traffic advice and makes an excellent substitute for those who don’t want to invest in the Garmin Zumo. This Ram Mounts Handlebar Smartphone Holder has a universal design that will fit anything from iPhones to Androids and comes with a spring-loaded holder that ensures stability on even the most uneven of riding surfaces. This is further encouraged by the high-strength stainless steel construction, giving you further peace of mind and easing any worries about the amount of the phone falling off during a ride. Should this happen – although that’s unlikely – the built-in tether will come to your rescue, and guarantees that whatever you’ve mounted will stay connected even if you don’t feel you necessarily will. You never know when you will need a strong, sturdy set of tools when out biking, so it pays to have the right gear with you at all times. While the Velomacchi Speedway Roll doesn’t supply the tools, if you’ve already got a trusty set, it’s the perfect upgrade from the old gym bag that’s already long past its best days. The roll is coated in a reinforced ballistic shell to protect should it tumble from your bike, but this isn’t really something to worry about. The snap buckle features, adjustable hook closures, and webbing straps fasten it securely and reliably to the motorcycle. And we all know how frustrating it can be when nuts and bolts disappear – seemingly – into nowhere, so this has built-in magnets to keep them where you need them to be in the event of an emergency. It’s always good when something does the job it’s intended to, and it’s even better when it’s as good looking as this, too. Just because you and your biker friends can’t use the good old car sharing to get around doesn’t mean there are no communication-aiding gifts for bikers. 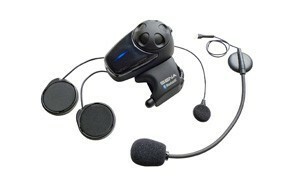 The Sena Motorcycle Bluetooth Headset is the answer to many times you’ve felt just a little lonely while riding along long stretches of nothing. Boasting long range music sharing up to 900 meters, you can share and share alike with your friends as you twist and turn through exciting scenic roads, and it’s all thanks to Bluetooth 3.0 connectivity. This gives you the most stable and reliable connection available and ensures that everything you hear is clear. There’s also advanced noise control, cutting down on external sounds such as engines, wind, and the occasional honking of horns from truck drivers. With 12 hours of talk time and 10 days’ standby time from just one charge, you’ll only rarely be caught with nothing but your thoughts and the patter of rain on your helmet. Find more great items like this by checking out our guide to the best noise canceling earphones. Tools – actual tools and not just tool rolls – are sometimes overlooked by amateur bikers, and if you know anybody who’s just celebrating their first motorcycle purchase, this is an excellent and surprisingly cheap gift that’s sure to get them out of more than a few sticky situations. With a voluminous set featuring multiple torque wrenches, screwdrivers, spark plug sockets, and pliers (among a plethora of other tools), the Pit Posse Motorcycle Tool Kit will set your new biker up for whatever they come across, especially if they’re planning their first solo ride as soon as the turkey’s been thoroughly devoured. These tools are high quality and will save their skin in 90% of roadside emergencies. Frankly, it would be negligent not to have them at all. While we all want to believe accidents happen to everyone but us, you never know what might be right around the corner. As a comforting peace of mind, the sheer volume of this set makes it one of the many great gifts for motorcycle lovers. The backpack is an essential accessory for any biker old and young. If you’re planning a mammoth road trip of nothing but the open world and self-discovery, they’re essential for helping you pack a few more essentials that won’t fit on the luggage rack. It’s crucial, then, you pick a stylish backpack that provides both comfort and functionality. If you want to go fast, with nothing whipping around and ruining your drag, then this OGIO NO Drag Mach 3 Motorcycle Backpack is the answer. Formed of a single shot mold, it perfectly deflects and wind resistance, and keeps up those high speeds for whenever you need them. It’s comfortable, it’s sleek, and it’s damn stylish, too. The ergonomic shoulder straps are perfect for long rides, while the panel comes with a security pocket and storage compartment, giving you an unrivaled organization that’s much better than stuffing any excess items into the pockets of your leathers. You might think any old backpack will do when you’re twisting and winding through exciting and unfamiliar roads, but this doesn’t always work for you. If you’ve ever been caught in a flash storm – because of course, you have been – you’ll know how depressing it can be to open your bag after finding shelter only to discover whatever’s in it is now ruined. Your travel journal, your laptop, your delicate cupcakes from grandma, everything. So why not save yourself that fear altogether and get your gloves on the Velomacchi Roll-Top Waterproof Backpack? The magnetic top closure ensures that nothing gets in – or out – while the side pockets make for easy access if the weather clears up for a couple of minutes. Multiple clips and side straps on this waterproof backpack are a huge benefit and are ideal for securing any excess motorcycle gear, and the 3-point harness system offers comfort, something every biker welcomes like a sunny – but not too sunny, leather – day. When you’re really in the zone when biking, it can feel like hours pass within minutes, so it might be best for you to get your hands on something that can keep track, even when you can’t. This smart and uber-badass Harley Davidson Bulova Watch is the ideal way for them to show off their love for the classic hog even when they’re not riding. With luminous hands, this Bulova watch provides suitable low-light reading, while the stainless steel bracelet ensures durability. It’s also water resistant up to 32 feet, so there’ll be no panicking once the rain falls. To top it all off, the Flying Skull face design is so cool it’s almost a painful biker cliche (only almost, though). If you know (or are) a Harley rider, then you’ll recognize this as one of the premium gifts for Harley riders, and if they don’t have a Harley (yet) it can be the first addition to their brand new collection for when they finally, eventually do. Sometimes, it’s not always possible to get the full-sized sort of motorcycle gifts for him, and so instead you may have to settle for the scale models. That’s not too bad of a tradeoff, though, and this Tamiya 1/12th Scale Kawasaki Ninja H2R is an awesome and highly detailed kit that may not be the real thing, but it’s close enough. With finely crafted liquid-cooled inline, you’re guaranteed authentic recreation, and also has the elegant trellis frame. There’s also a screw fastened engine, swing arm, and cowls, which – if you were tiny – would cause you to leap right on and hit the road. You aren’t tiny though. Still, anybody who loves assembly models as much as they love bikes will savor this experience like little else. This supercharged, 300 horsepower behemoth (the real thing we mean) will cost you upwards of $50,000 – and that’s without a warranty – so this seems like a fair tradeoff until you strike rich and can finally treat yourself like you deserve. This Oxford Stormex Motorcycle Cover is one of those motorbike gifts that are always much appreciated. Maybe it’s because riders don’t think about it, maybe it’s because they do think about, but don’t want to splash the cash. Whatever it is, if you want to make a rider’s year with something simple they can use every day; here it is. If your bike needs protection from all the elements, then there’s no better choice than this guy right here. It will withstand water, abrasion, and heat, ensuring that the bike remains safe and dry in the rain, while also keeping the seat and handlebars cool during summer. At the base, the wrap-around splash protector stops water absorption from seeping through the cover. It works so well, in fact, that even if you can see the rain with your own eyes, you’ll struggle to believe the downpour even occurred once you get to your bike. Although more associated with mountain biking, Fox still has a place among the motorcycle community – we’ve all got to start on some kind of bike, after all. This Fox Leather Bifold wallet is an excellent and compact product that allows for easy access to cash and cards, particularly when wearing biker gloves. At just 4.5 inches wide, it’s small and slim enough to slot comfortably into breast pockets, back pockets, and side pockets of backpacks, while still being within grasp should you need to grab it in an instance. The bi-fold design is very much a standard travel wallet style, but this just means you’ll feel more comfortable using it. The final straight on this enjoyable – right? – the ride is something that all motorcyclists crave, even if they’ve once adamant they’d get on fine without it. The Cortech Super 2.0 Magnetic Mount Tank Bag is a one-stop storage and transport solution and is a reliable accessory for the long, potentially wet journeys. It’s both roomy and stylish, and offers a range of storage options, including paper maps if you like to do it old school, and has accessible compartments for easy-reaching. Cortech have also constructed it from durable materials that ensure a long life. It’s roomy and surprisingly stylish, considering it is a tank bag. From what we’ve read, it is the perfect size for the Honda CB500X, but there are other bikes it will on and serve you well, too.